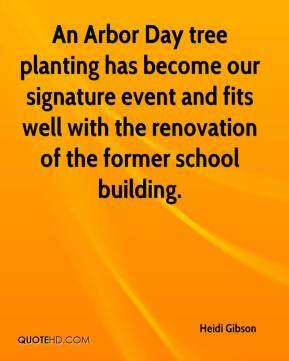 An Arbor Day tree planting has become our signature event and fits well with the renovation of the former school building. 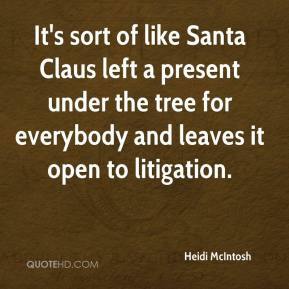 It's sort of like Santa Claus left a present under the tree for everybody and leaves it open to litigation. Instead, they're cultivated like corn or potatoes on plantations. 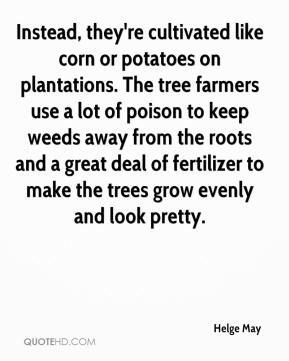 The tree farmers use a lot of poison to keep weeds away from the roots and a great deal of fertilizer to make the trees grow evenly and look pretty. 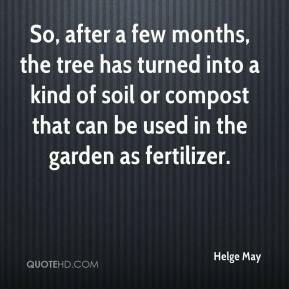 So, after a few months, the tree has turned into a kind of soil or compost that can be used in the garden as fertilizer. 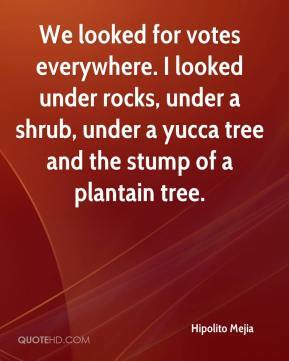 We looked for votes everywhere. I looked under rocks, under a shrub, under a yucca tree and the stump of a plantain tree. 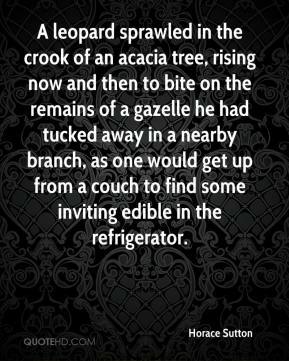 A leopard sprawled in the crook of an acacia tree, rising now and then to bite on the remains of a gazelle he had tucked away in a nearby branch, as one would get up from a couch to find some inviting edible in the refrigerator. 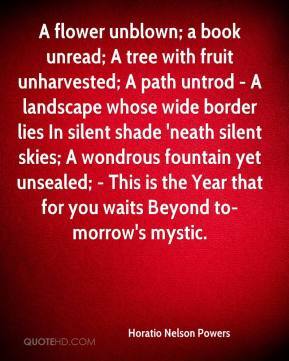 A flower unblown; a book unread; A tree with fruit unharvested; A path untrod - A landscape whose wide border lies In silent shade 'neath silent skies; A wondrous fountain yet unsealed; - This is the Year that for you waits Beyond to-morrow's mystic. 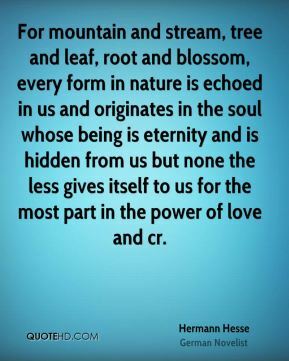 For mountain and stream, tree and leaf, root and blossom, every form in nature is echoed in us and originates in the soul whose being is eternity and is hidden from us but none the less gives itself to us for the most part in the power of love and cr. 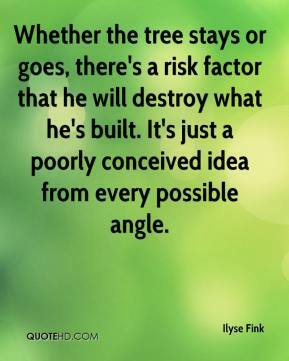 Whether the tree stays or goes, there's a risk factor that he will destroy what he's built. It's just a poorly conceived idea from every possible angle. 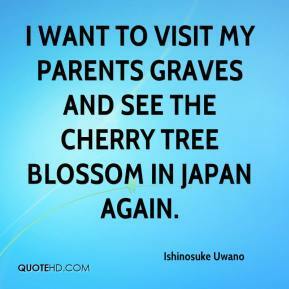 I want to visit my parents graves and see the cherry tree blossom in Japan again. 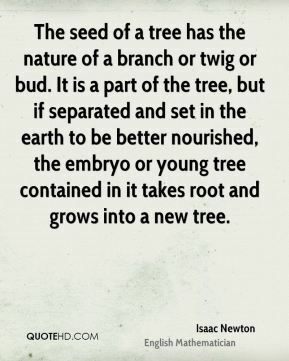 The seed of a tree has the nature of a branch or twig or bud. 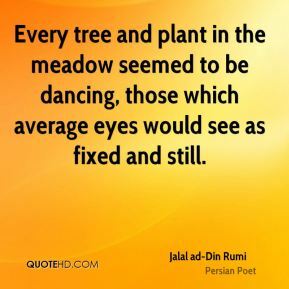 It is a part of the tree, but if separated and set in the earth to be better nourished, the embryo or young tree contained in it takes root and grows into a new tree. 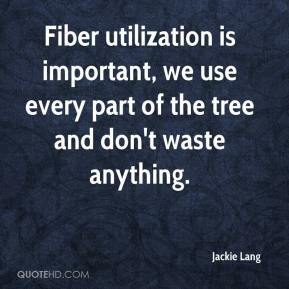 Fiber utilization is important, we use every part of the tree and don't waste anything. This just allows us to hit the ground running. 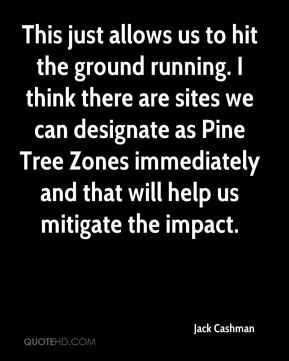 I think there are sites we can designate as Pine Tree Zones immediately and that will help us mitigate the impact. All I knew is my son was supposed to stay away from tree nuts. But we were not in the habit of reading food labels. 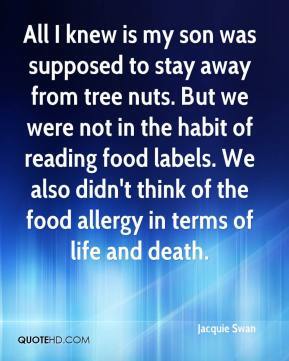 We also didn't think of the food allergy in terms of life and death. 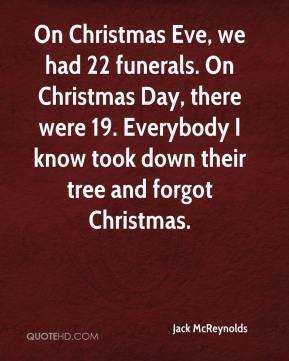 On Christmas Eve, we had 22 funerals. On Christmas Day, there were 19. Everybody I know took down their tree and forgot Christmas. 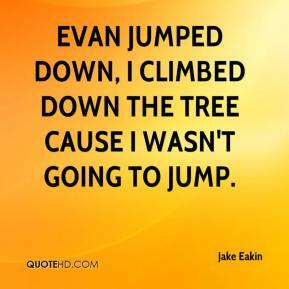 Evan jumped down, I climbed down the tree cause I wasn't going to jump. It went up like a Christmas tree. I was trying to put it out with a bottle of water. I turned around and the building was engulfed. My sound man is injured. 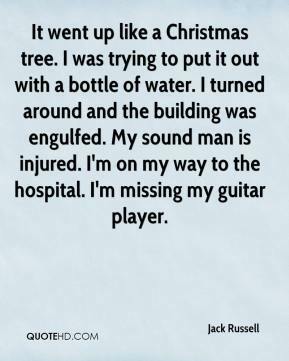 I'm on my way to the hospital. I'm missing my guitar player. 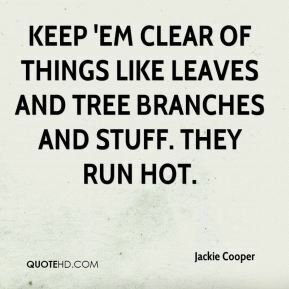 Keep 'em clear of things like leaves and tree branches and stuff. They run hot. 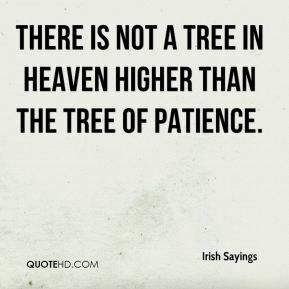 Hopefully, you'll watch this tree. 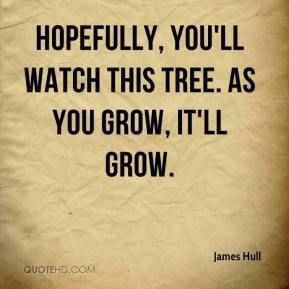 As you grow, it'll grow. 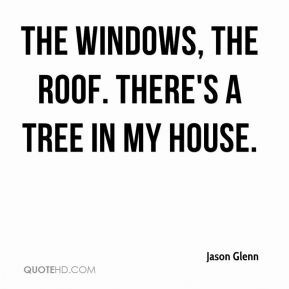 The windows, the roof. There's a tree in my house. 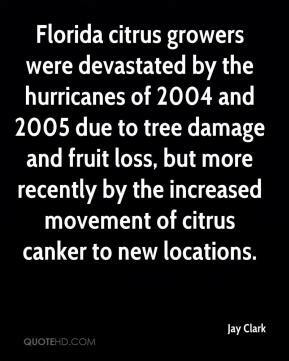 Florida citrus growers were devastated by the hurricanes of 2004 and 2005 due to tree damage and fruit loss, but more recently by the increased movement of citrus canker to new locations. 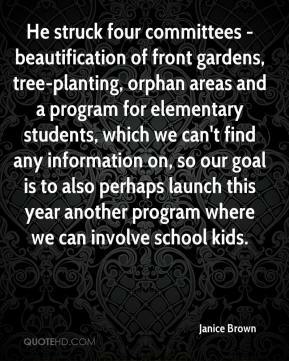 He struck four committees - beautification of front gardens, tree-planting, orphan areas and a program for elementary students, which we can't find any information on, so our goal is to also perhaps launch this year another program where we can involve school kids.